↑ "Wahhabi". GlobalSecurity.org. 2005-04-27. Archived from the original on 2005-05-07. http://web.archive.org/web/20050507090328/http://www.globalsecurity.org/military/world/gulf/wahhabi.htm। আহৰণ কৰা হৈছে: 2008-05-10. ↑ Our good name: a company's fight to defend its honor J. Phillip London, C.A.C.I., Inc – 2008, "wahhabism is considered in particular an ultra-conservative orientation". ↑ Kampeas, Ron. "Fundamentalist Wahhabism Comes to U.S.". Belief.net, Associate Press. http://www.beliefnet.com/Faiths/Islam/2001/12/Fundamentalist-Wahhabism-Comes-To-U-S.aspx। আহৰণ কৰা হৈছে: 27 February 2014. ↑ "Wahhābī". Encyclopædia Britannica Online. http://www.britannica.com/EBchecked/topic/634039/Wahhabi। আহৰণ কৰা হৈছে: 2010-12-12. ↑ Commins, David. The Wahhabi Mission and Saudi Arabia. I.B. Tauris. পৃষ্ঠা. vi. http://books.google.co.uk/books?id=kQN6q16dIjAC&printsec=frontcover&dq=wahhabism&hl=en&sa=X&ei=vpIPU5DNPNTyyAG85IGACQ&ved=0CDUQ6AEwAQ#v=onepage&q=wahhabism&f=false. 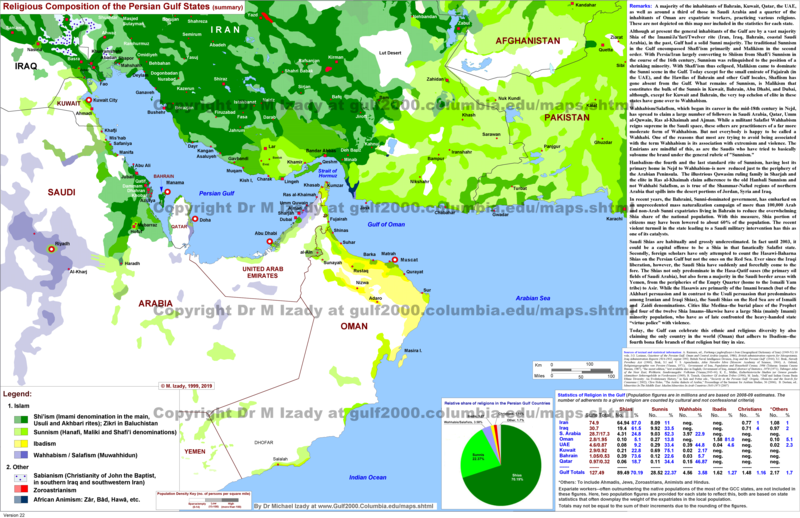 ↑ 9.0 9.1 "Demography of Religion in the Gulf". Mehrdad Izady. 2013. http://gulf2000.columbia.edu/images/maps/GulfReligionGeneral_lg.png.